Once upon a time, there were 3 little pigs whose names are unpronouncable in your tongue. Like many others, I have an irrational fear of spiders, but (possibly unlike many others) I also find them weirdly attractive. Like maybe a car crash, or a particularly ignorant string of comments from an evil troll, or like a… Like a terribly fascinating spider that you can’t look away from because you’re convinced that the instant you do, it will open a portal into the Void Beyond All Things and use its demonic powers to grow ten-thousand times its size and consume you like the delicious hors d’oeuvre you know deep down that you are. You get the idea. So when Fraser came to me with the news that “there’s a green and black Nope by the garbage cans” I naturally had to go and see. 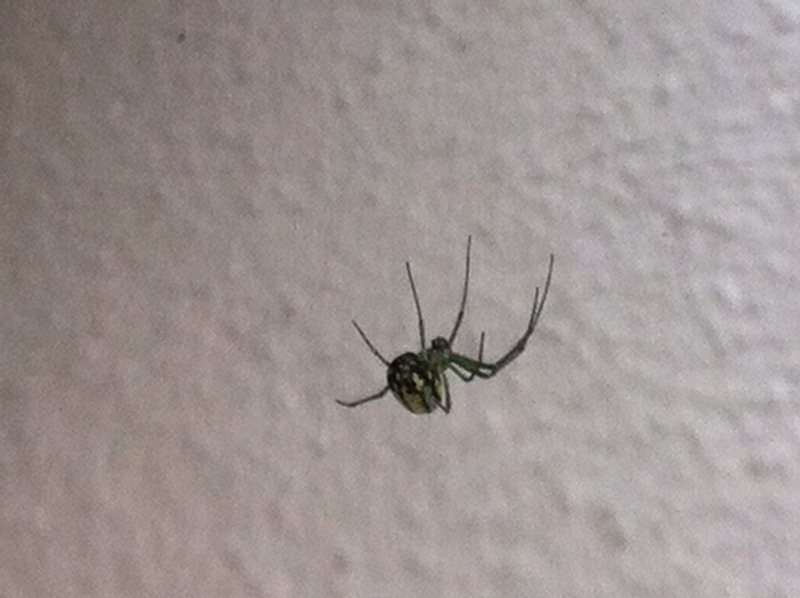 I grabbed my phone to take pictures, but I could not capture the spider’s topside because he insisted on hanging out on the underside of his web. I did the best I could though. 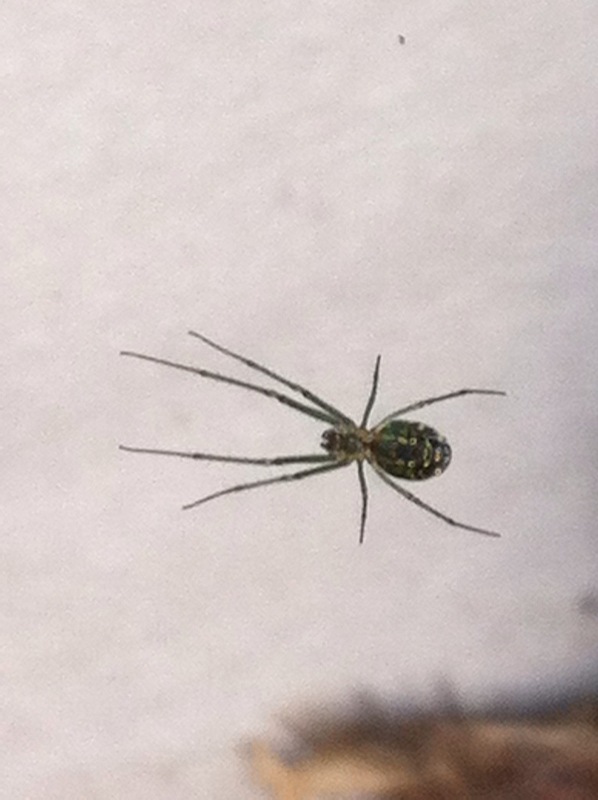 Here are some pictures of spiderbutt. 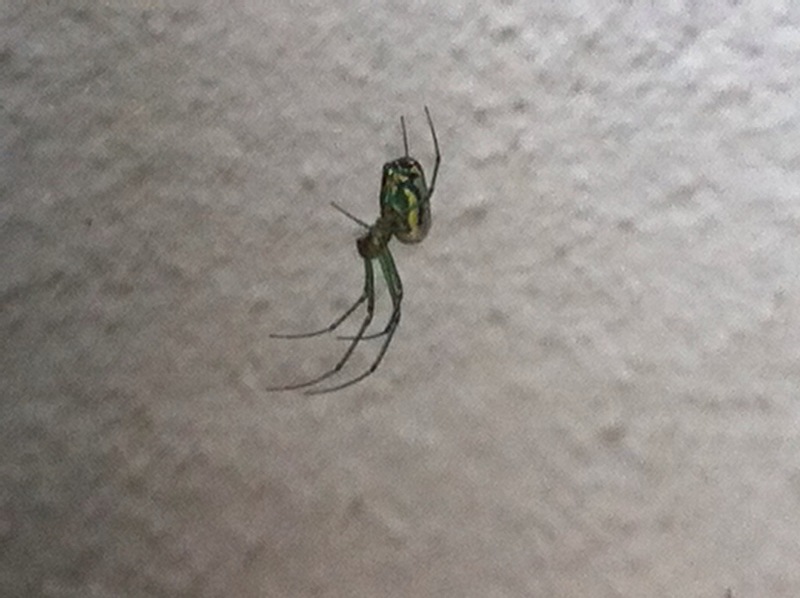 We looked it up, and it is apparently an Orchard Orb Weaverleucauge-venusta. 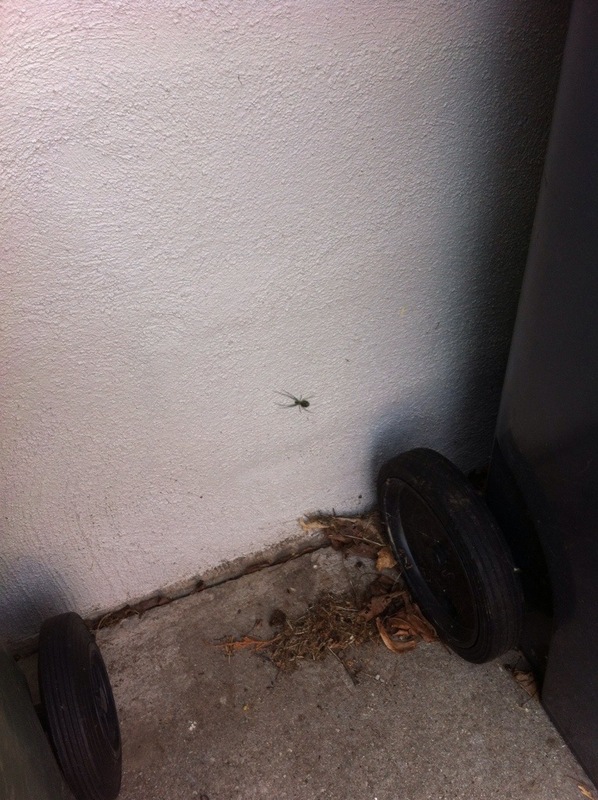 News flash, Mr. Spider: my garbage cans are not fruit trees. Skitter on back home so I don’t have nightmares about you finding your way into my bedroom! Tags: Nope, what the heck is this thing in my backyard? The mild winter was very kind to out little wild strawberry patch in the back garden. 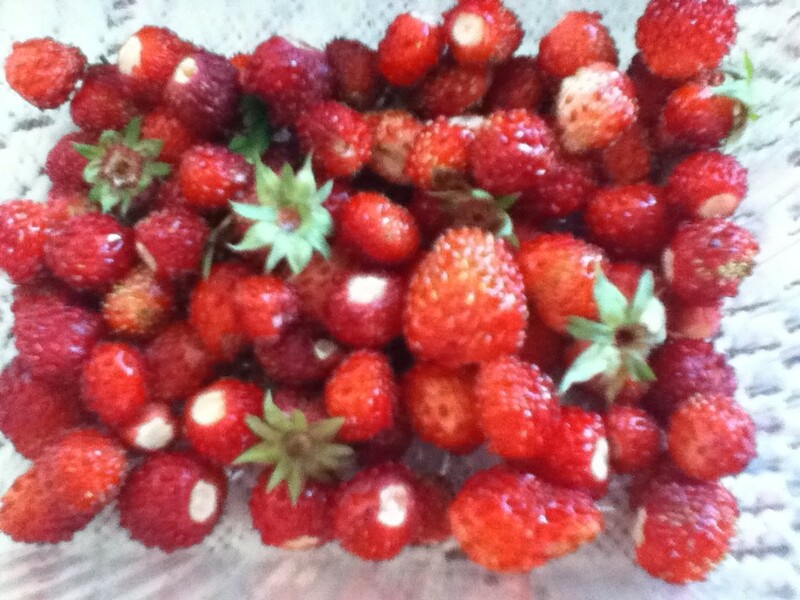 We’ve been enjoying super-sweet bursts of strawberry flavour whenever we go into the back yard. Today I picked a bunch of the bigger ones (and bigger is a relative term; the biggest one is a little under the size of my thumbnail, and it’s noticeably bigger than most) and I took a picture of our gigantic strawberry crop! I can’t wait until the raspberries are ready! 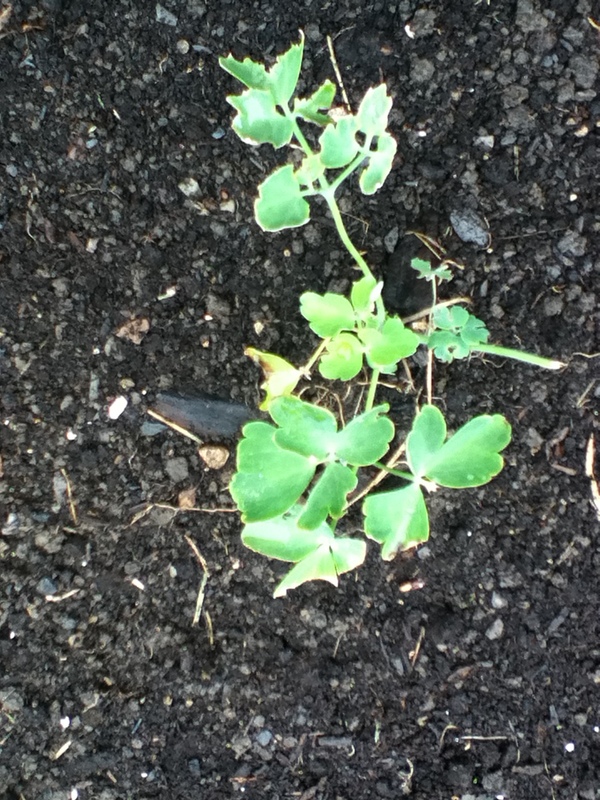 So I’m a lazy, lazy gardener but I finally got around to planting my nasturtiums today! I’m so proud of you, little guy! A frog leaped up; He was scared of a mouse. Once there was a girl who never left her room. She slept all day and all night and sometimes she watched tv. When she was hungry she ate delicious food delivered to her door and when she was thirsty she drank the sweetest water from a bubbling spring that fed right into a tap in her room. The moral of the story is: Winter is cold and I don’t like it. Frogs have no sense of self preservation. I was walking to school along the path by the woods the other day, and I had gotten to almost the end when about 3 feet away from me I spotted a large frog. So the frog sees me and goes ‘ack, a human!’ and predictably (against all sense) hops toward me. I decide to employ a strategy of sudden stop followed by a lack of movement. The frog continues with its strategy of hopping toward me in order to get away. I continue to stand still. The frog hops onto my shoe. Alas, the frog continues in its attempt to hop toward me. Since it is now standing on my shoe, this means it is attempting to hop up my pantleg. The frog attempts again to hop up my leg. The frog rebounds off my knee and lands back on my shoe. The frog one more time just to see if the same thing will happen. I take a quick shuffle step to the side. The frog misses my leg (third time’s a charm) and hops off into the bushes. Finally. …on the other hand, maybe I misread the frog. Maybe it was actually a Prince transformed into a frog by an evil fairy. Maybe it was hoping to hop up, land on my knee, hop up again, give me a quick kiss on the lips, transform into a handsome Prince and whisk me off into a sparkling world of castles and sunsets. This is why I’m not royalty yet. I just don’t recognize opportunities when they’re in front of me. Berries flower Frogs Kitchen Sink Nasturtium Nope re-seed Silly Story Saturday Strawberries Summer what the heck is this thing in my backyard?